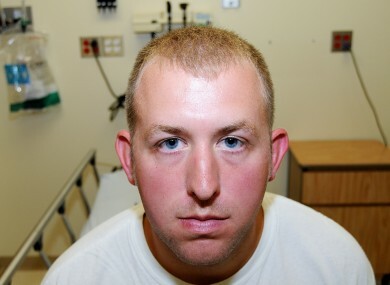 Darren Wilson has spoken for the first time since being cleared over the shooting of Michael Brown. THE POLICE OFFICER who shot dead unarmed black teen Michael Brown in August has reportedly said he “has a clean conscience” about the incident. Darren Wilson killed 18-year-old Michael Brown in Ferguson, Missouri on 9 August, but a grand jury in nearby St Louis last night ruled he would not stand trial on criminal charges. That decision prompted rioting, looting as well as peaceful protesting in Ferguson, St Louis, and throughout the United States overnight. But in an exclusive interview with US network ABC News, to be aired this evening, Wilson has spoken about the incident for the first time. Wilson also reportedly said that his actions would have been no different if Brown were not African-American. The facts of the shooting remain a contentious subject among some observers, and the timing and content of Wilson’s interview are likely to increase tensions, as authorities in several American cities prepare for a second night of disruption. One American TV industry insider has reported that Wilson was not paid in any way for the interview. TV nets sometimes find $$$ ways to "win" exclusive interviews. But not Darren Wilson: ABCer says "No payment, no licensing, no NOTHING." You can trawl through the details of the Michael Brown case with the New York Times’ exhaustive collection of official documents and photographs, and you can catch up with the rest of our coverage here. Email “Ferguson: Cop who killed unarmed black teen 'would not do anything different'”. Feedback on “Ferguson: Cop who killed unarmed black teen 'would not do anything different'”.